Adaptability: the MH 6 series is modular in design: so that a basic unit for laboratory-trial-scale development can be upgraded as production needs increase. Weight: gross packed 71 kg (including 1 spare spore cylinder in 2 boxes). Electrical supply: 3-phase or 220-240 v. MycoHarvesters are normally supplied either with 13 amp (rectangular pin, fused) or European standard (round pin) plugs. 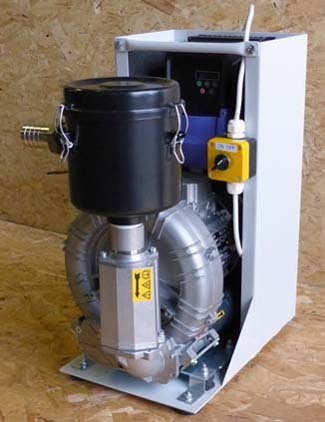 Other standards can be fitted on request, otherwise equipment will be supplied without plug. The MycoHarvester 6 is first and foremost a research tool for mycopesticide development. This device is an "enabling technology" designed for small-medium scale sample preparation (typically processing up to 50 kg of substrate to produce approximately 1 kg of spores per day). Scaled-up units (the MH 3) are also available, which use a different method of substrate agitation. Since the MH 6 uses essentially the same cyclone geometry, it simulates scaled-up mycopesticide production. The MH 6 is suitable for small-scale, non-continuous preparation of samples of beneficial microbial agents, in genera such as: Metarhizium, Beauveria, Paecilomyces, and similar powdery fungi used in mycopesticide products. It also has been used with several species of Trichoderma. If spore separation problems are encountered, initial approaches might include: reducing the surface moisture content of the substrate (we recommend <20%) and factors that influence fungal conidiation (nutrients, rate of drying etc.). 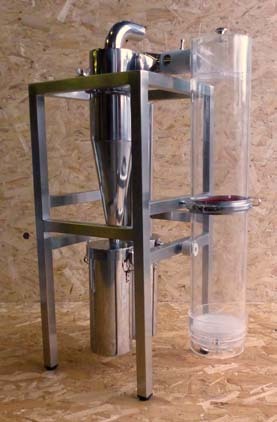 High quality spore separation, which can enable the development of physically stable formulations. Operator safety: spore dust is sucked into the machine. ... facilitating better storage by concentrating spores for subsequent thorough drying. Different fungi have different production characteristics. The surface properties and morphology of conidia vary considerably between different fungal species. Before processing, the substrate surface should be dry: but the degree of drying required before processing must be determined experimentally. Having separated pure spore preparations, work can commence on optimising storage (usually a function of moisture content and temperature) and formulation and packaging. The development of storage models has also proved to be an important tool for estimating shelf life: Tran Hong et al. (2001) have adapted seed storage models for mycopesticide use, which have been proven with M. anisopliae and Beauveria bassiana. Further information on formulations can be obtained from Burges (1998) and quality control by Jenkins & Grzywacz (2000). We strongly emphasise that although these parameters have been established for products such as 'Green Muscle', other fungal isolates are likely to differ substantially and all procedures must be checked carefully before large scale production begins. Your MycoHarvester helps to ensure that experimental results are not confounded by presence of substrate, mycelium and other contaminants. Burges, H.D. (ed.) (1998) Formulation of Microbial Biopesticides, beneficial microorganisms, nematodes and seed treatments. Publ. Kluwer Academic, Dordrecht, 412 pp. Hong, T. D., Gunn, J., Ellis, R.H., Jenkins, N.E., Moore, D. (2001) The effect of storage environment on the longevity of conidia of Beauveria bassiana. Mycological Research 105(5): 597-602. Jenkins,N.E. and Grzywacz, D. (2000) Quality control of fungal and viral biocontrol agents - assurance of product performance. Biocontrol Science and Technology 10: 753-777.